Far from the fanfare of mushrooming literary festivals where it’s not the books but the celebs and their dresses that take the center stage, at a safe distance from the hashtags, aloof from the crooning book jackets screaming bestsellers in bold, lives the hermit whose name leaps over generation barriers. I may be a dog, but I know who India’s most loved writer is. The name is Bond…Ruskin Bond. 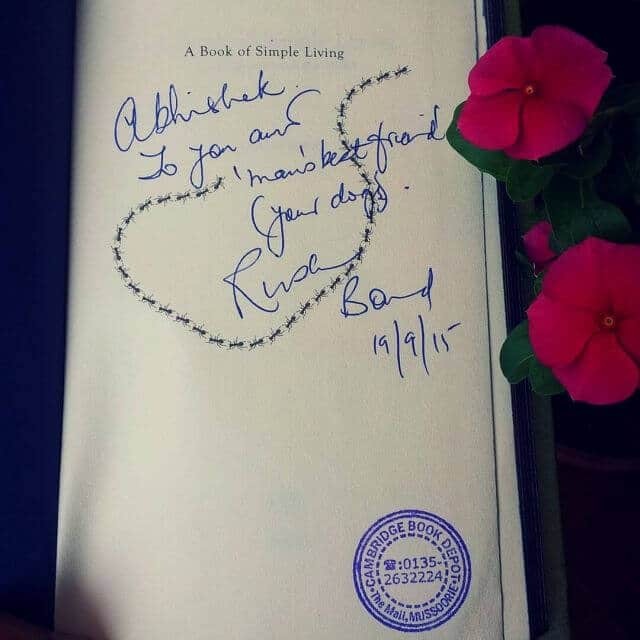 Ruskin Bond scribbles for ‘Dog with Blog’. For many from my generation who have neither grown up nor really found a place in the wilds of the world, our pilgrim remains Ivy Cottage, Landour. 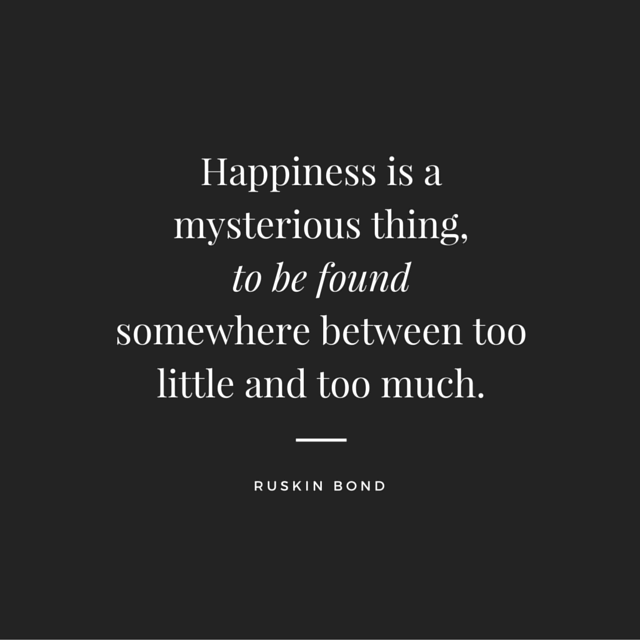 Here are 27 Ruskin Bond quotes on love and life, hills and heartbreaks, seasons and sorcery and the ghosts and geraniums. 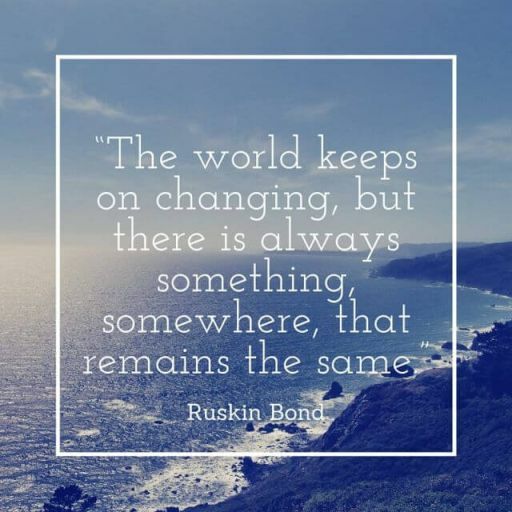 Ruskin Bond quotes on life: Ruskin observes and reports on life like he only can. His succinct phrases tell me more on the meaning and motive of life than all the gospels. In our imperfect world, there is far too much talk and not enough thought. Ruskin Bond quotes on writing: My first brush with Mr. Bond’s writings was The Woman on Platform 8, the heart-touching story of maternal affection. The woman who meets a young boy on the platform, whom she has no hopes of meeting again but devotes all her love to him. Ruskin Bond quotes on nature: Ruskin’s father introduced him to nature as the best friend of human beings. To this day, Mr. Bond hasn’t forgotten this. His writings on the wild-flowers, ladybirds, the smell of the rains and thunderlights over Pari tibba retain this rustic charm. Because there's no 'Y' in Happiness. Ruskin Bond’s writings on love, be it The Night Train At Deoli or Death of a familiar, did more for my teenage ideas of romance than any Bollywood movie. To understand that depth and pause in today’s digital age makes one return to her elements. And that's when you find love. And so often I wondered how real was Sushila from ‘Love is a sad song’? The beautiful short story that has the writer reminiscing his past. I may stop loving you, but I will never stop loving the days I loved you. Sometimes I wonder if this is my life or a reverie. The trouble with reading Bond is, that you don’t want to return to the real world. I want to play Ruskin Bond, to be amidst hills, without an eye to judge me on stakes of money, stature or profile. Meeting Ruskin Bond (either through his books or in person) is an exorcism that cleanses all the demons of adulthood and makes one who we once were, innocent. His stories smell of the hills. The way hills no longer smell of them. Where can you meet Ruskin Bond? Well, apart from the books, you may meet Ruskin Bond at Cambridge Book Depot, Mall Road, Mussoorie where he meets his fans every Saturday. Excellent collection. I have read most of Ruskin Bond’s autobiographical books but a couple of these were new to me too. Being an ardent dog lover and a voracious reader I loved this blog. Keep up the good work! The quotes were so fantastic..gave me so much happiness..want to read them again and again. Previous Previous post: What if your dog could sing? Next Next post: You need to know these wonderful Delhi dogs!